Medical Grade Knee Wraps Designed to Heal. If you've read through any other parts of our site, you will quickly have learned that King Brand® Healthcare is all about making the best products you can possibly get. ColdCure® Technology represents a massive step forward from RICE to RCCE®. And that step is much greater than most people realize. When you buy a cold compression knee wrap from King Brand® with ColdCure® technology you are buying a wrap that is superior in so many ways. Only King Brand wraps use our own specially formulated non-migrating gel that is soft to the touch but doesn't flow under pressure. We call this RigiGel®. It's not a solid and it's not a liquid either. It's something in between. It is very unique and very, very hard to make. Why is this important? RigiGel® means that the gel stays in place over the area of your knee injury when pressure is applied and does not flow away to other parts of the wrap. This is very important. You want the pressure over the injured area. You also want the cold there too. And, you want it to be soft and comfortable because your knee hurts! With our specially formulated non-migrating, soft RigiGel®, you get it all. The gel stays in place even under heavy pressure for long periods of time. In fact, our non-migrating gel works so well that you can sleep with it on your knee all night long and the gel will still be in place protecting your knee in the morning. No other gel does that. Second, you have to have enough gel to do the job properly. This is the biggest failure with all the other knee wraps. A knee wrap with tons of gel is a lot more expensive to make. A wrap with tons of gel is heavy and therefore a lot more expensive to ship. So the market is full of pretty wraps with just a little bit of gel. And a little bit of gel is not going to help you. You want tons of gel. You want tons of RigiGel® You want to relieve the pain. 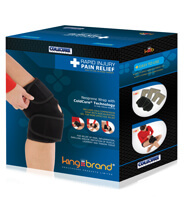 Every King Brand® knee wrap come with 3 very large packs of gel in each box. There's one very large gel pack already in the wrap and 2 more that you can swap in and out quickly to keep your therapy going. For example, our knee wrap comes with 3 gel packs that weigh about 4lbs (2 kgs) and that's just the gel packs alone. Compare that to most other wraps on the market that weigh about 1lb or less including the wrap. In many cases King Brand wraps contain 10 times the amount of gel of other wraps. That means a huge difference in the treatment you receive. And this brings you value. For the last 100 years, healthcare workers, athletes and physical therapists were trained that RICE is the formula to follow immediately following a soft tissue injury. RICE stands for Rest, Ice, Compression, and Elevation. The truth is that ice is too cold to be the best method for treating pain from soft tissue injuries. The proper solution is RCCE® - Rest, Cold, Compression, and Elevation.. We don't want to apply ice, we want to apply cold that is NOT below freezing. Yes, you want cold - and lots of it - but not so cold that it is below the freezing point of water and body tissue. 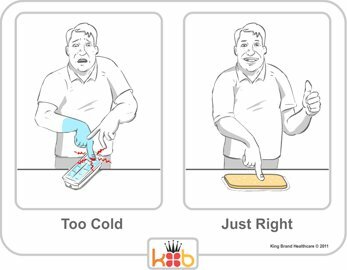 The problem with ice (and other freezer based substitutes such as the modern day ice pack) is that it can freeze the skin causing 'cold burns'. Ice is even more dangerous if you use it enough that it numbs the nerves and you don't feel the permanent damage that you are doing to the underlying tissue. Ice pack injuries are so common, there are actually law firms that specialize in representing people who suffer ice pack injuries. Don't let that happen to you! With King Brand® ColdCure® packs you are completely safe. You will get the relief from pain and swelling that you need. If you still want to use a freezer pack, you should know that you can put ColdCure® packs in the freezer. Even at the coldest freezer temperature they retain all their flexibility and cold capacity. In terms of flex and form they feel exactly the same at 100 degrees as they do at -20 degrees. Even as freezer packs, they far outperform everything on the market, but we still recommend you start by using them at refrigerator temperatures. It really is the best choice for your health. How much better can a ColdCure® wrap be? You will be amazed. Something so simple can be changed an awful lot. We have put a lot of time and effort into the development of these knee wraps. We have experimented with many, many gel formulations. There are improvements to our gel packs that we don't even talk about because, quite honestly, we've spent a lot of time and money making our products better and we're not going to just give our ideas away. Many of our improvements are patented. Some are still going through the patent process (but are already in the product we sell). At the end of it all though, you can be sure that a King Brand® cold compression knee wrap with ColdCure® technology is far superior to any other product in the market in - many, many ways. Get one and start feeling better today. Want to Heal your Knee even Faster? actively stimulate blood flow in injured Knee tissue. 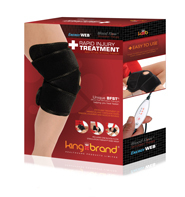 King Brand Healthcare Products also manufactures and sells a line of medical devices that stimulate the blood flow in your Knee promoting rapid healing. These are the devices professional athletes use when they are injured to get back in the game in a matter of days instead of sitting out for weeks from their injury. You can get the exact same treatment for your knee injury. With a BFST® Knee Wrap you can actually stimulate your blood flow and the healing process. get ColdCure Technology® from King Brand®. Note from KB WebMaster - The text below is primarily intended to assist with Google properly classifying this page content. To learn more about our products please visit our website.<br>ColdCure is the best Knee wrap money can buy. Ordinary Knee wraps are not as good as a ColdCure Knee wrap. Knee wraps reduce swelling. ColdCure Knee wraps relieve pain. We have shoulder wraps, ankle Knee wraps, Knee Knee wraps, elbow Knee wraps, back Knee wraps and general Knee wraps. Cold Cure wraps have reusable Knee wraps. Reusable gel packs are a better name. Knee wraps are actually not as good as cold packs. Our gel packs stay cold and stay in place. There are many reusable icepacks on the market, but none are as good as coldcure for relieving pain and keeping you safe. Reusable Knee wraps that are stored in the freezer can be dangerous. They can cause the skin to freeze. ColdCure cold wraps don't have that danger. There is only one excellent Cold compression wrap. The best Knee wrap is the coldcure wrap.